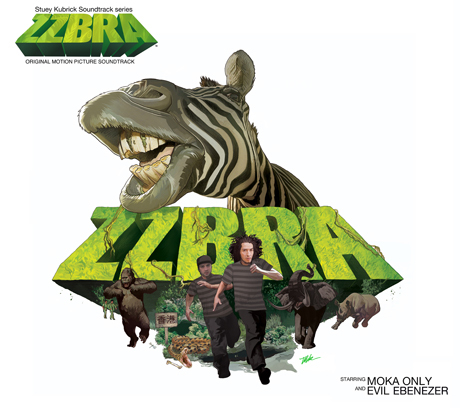 Last month, BC rap mainstay Moka Only introduced us to his new project ZZBRA, which features fellow West Coast rhymer Evil Ebenezer. Now, the duo have unveiled the details of their curiously titled debut album ZZBRA: The Original Motion Picture Soundtrack, due out January 31 via Camobear Records. A press release describes the album like this: "Set deep in the jungle with wild animals preying on the crew, two Canadian rappers were getting ready to make their big screen debut in Stuey Kubrick's Pan-African adventure epic ZZBRA. Skyrocketing costs catapulted their budget through the roof forcing production to shut down, and sending everyone home. All that was left from the movie was the original soundtrack." Okay, we're guess that's all a joke, and this is just a gimmick to promote the debut collaborative album from these two MCs. The 14-track collection was produced by the Draft Dodgers, aka Stuey Kubrick and U-Tern. Stuey also directed the video for "Green," which you can see at the bottom of the page. He will also reportedly "unveil the trailer for the legendary ZZBRA movie that never was" sometime soon. Again, we're skeptical. Stay tuned for Canadian tour dates to be announced in the near future. 6. "Call for Some Help"
12. "Like I Love You"